The unit can be used as a learning centre or to supplement teacher-led lessons. Each activity is designed for independent work by primary children. Best of all, this unit was written by a primary teacher, Deborah Gutosky, who understands the need for ready-to-use resources! Below are four activities from Goofy Groundhogs to use in your classroom. Paint eyes on the groundhog. Use the brown plasticine to make a nose and four legs. Fill the eggshell half full with potting soil. Sprinkle on the grass seed. Keep the eggshell moist in a lighted area. Measure and record the growth of your groundhog. Every year the groundhog awakens on Groundhog Day to look for his shadow. A shadow is made by blocking light. You will use shadows to make silhouettes. Tape a piece of white paper on the wall in front of the light source. Have a child sit on the chair sideways between the lamp and the paper so that his/ her profile is projected onto the paper. Trace the outline of the silhouette on the paper. 1. What made the shadow? 2. Is your silhouette the same size as your head? If it is not, why do you think it isn’t? The direction from which the sun shines changes during the day. 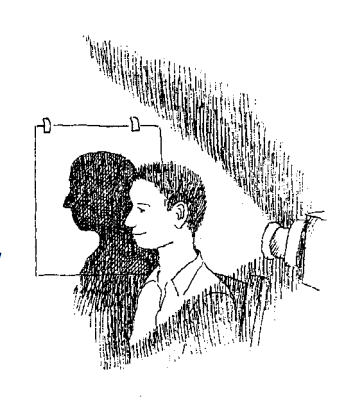 You will make a shadow stick to show how the sun shines from different directions. Stick the plasticine in the middle of the posterboard. Put the popsicle stick in the plasticine. 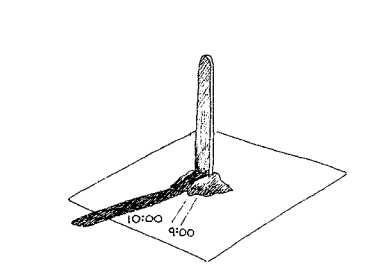 Place the shadow stick outside in the morning so that it casts a shadow on the posterboard. Use your pencil to trace the shadow on the posterboard. Trace the shadow every hour and write the time by the shadow. 1. Did the shadows change? 2. Why do you think they changed? 3. At what time was the shadow longest? 4. At what time was the shadow shortest? On Groundhog Day you might see snow and ice on the ground. Ice is a solid. As ice melts it becomes a liquid. In this experiment you will see how fast you can melt an ice cube. Find a way to make your ice cube melt. You may not smash it or break it in any way. Have a race with your friends to see who can melt the ice cube fastest. 1. How did you melt your ice cube? 2. Did you try using the heat of your body? 3. What happens if you rub your hands together before holding the ice cube? 4. Can you use dark clothing or objects to melt the ice? Each year, on February 2 the groundhog peeks its head out of its burrow. The groundhog becomes afraid if it sees its shadow and immediately goes back to sleep. That means winter will last six weeks longer. Spring will come early if the groundhog does not see its shadow. Farmers from Germany brought the tradition of Groundhog Day to North America. In Germany the people believed that the badger (a member of the groundhog family) comes out of the ground on February 2 or Candlemas Day to predict the weather. When German farmers moved to North America they substituted the groundhog for the badger in the traditional story. What Does A Groundhog Look Like? The groundhog is a member of the squirrel family. It is sometimes called a woodchuck. The groundhog is grayish-brown on the upper parts of its body and yellowish-orange underneath. A groundhog is about 60 centimetres long including its bushy tail. 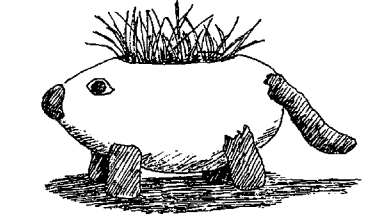 It has a broad, flat head with a blunt, stubby nose and rounded ears. Its eyes are set close to the crown of its flat head. Groundhogs have short, powerful legs with claws on their forepaws and hind feet. The claws enable the animal to dig holes. Groundhogs also use their paws to grasp objects and are able to hold food in their “hands” in order to eat. What Does A Groundhog Do In Winter? The groundhog hibernates during winter. It must prepare for hibernating by eating a great deal of food before it goes to sleep. The groundhog eats alfalfa, clover, grasses and bark. Groundhogs hibernate on bedding that is at the end of their tunnel, below the frost line. To keep out unwanted visitors, the groundhog seals up the entrance to the tunnel with dirt. Once it has done this, the groundhog rolls itself into a ball and goes to sleep. What Does A Groundhog Sound Like? A groundhog is capable of making different sounds depending on whether it is angry, frightened or curious. When a groundhog is afraid, it grinds its teeth and makes a squealing and snarling sound. If a groundhog becomes annoyed, it makes a chattering bark. Female groundhogs communicate with their young by barking and grunting. What Are The Groundhog’s Enemies? The groundhog has many enemies. Some of these enemies prey upon the groundhog for food. Other enemies make life difficult for the groundhog. Here is a list of the groundhog’s enemies for you to read. A groundhog’s tunnel may have many different entrances. It can look like an underground maze. The tunnel always has a sleeping chamber and two or three other rooms. One of these other rooms is used for a toilet—groundhogs are very clean animals. 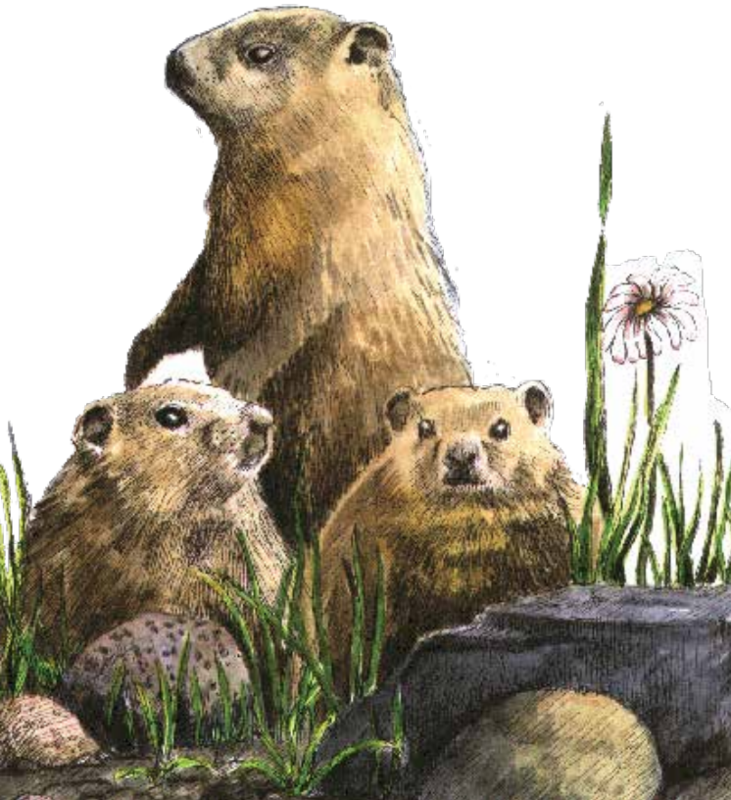 If the female groundhog has babies, she will dig nesting chambers in the tunnel for her babies. How Does A Groundhog Dig Holes? The groundhog is like a digging machine. It digs very quickly. It can bury itself completely in one minute! The groundhog has a special method for digging holes. It digs into the ground using its powerful front claws and throws the dirt backward with its hind feet. The groundhog can dig tunnels two or more metres under the ground. 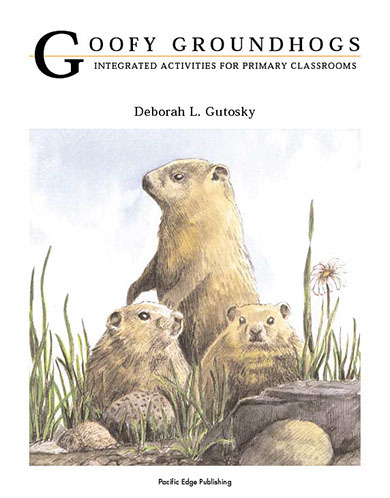 Deborah Gutosky is the author of Goofy Groundhogs. This activity insert is from Canadian Teacher Magazine’s Jan/Feb 2013 issue.